Even after living here for three and a half years our master bedroom still just does not feel like a space that suits us. It’s got a lot going for it. It’s a nice size with (literally) a dozen windows and an assortment of furniture that is all great individually, but somehow it’s not all working together. I saw a photo recently of a four-poster bed that had been painted a bold color and felt inspired. Is this maybe what the room is missing? I’m tempted. Really tempted. My bed is not a precious heirloom or even vintage. I bought it from Craigslist for $200 and it’s not in great condition. If I did paint it I’d probably lean toward something like the green in the last photo above. Not only have I been really into kelly green lately, but I think also it would make a nice contrast to the blue dresser and armoire in the room (which I wouldn’t be opposed to painting a more neutral tone if it gets too crazy in there). And you know what else I could do? I could upholster the headboard. Maybe even in a similar shade of green for some cool tone-on-tone action. Here’s the thing: should I paint the bed in place with a small brush and roller, or disassemble it and haul the whole thing to my sister’s place 45 minutes away to borrow her paint sprayer? The sprayer would probably lend a smoother result, but am I really interested in that sort of endeavor at this point in my life? I mean, I have a toddler and a job. Who am I trying to impress? If I manage to get this thing painted at all it will be considered an accomplishment. I love your plan, Marilynn. You know…I don’t think I’m feeling it. Most of your inspiration photos either look like or are of kid’s rooms. 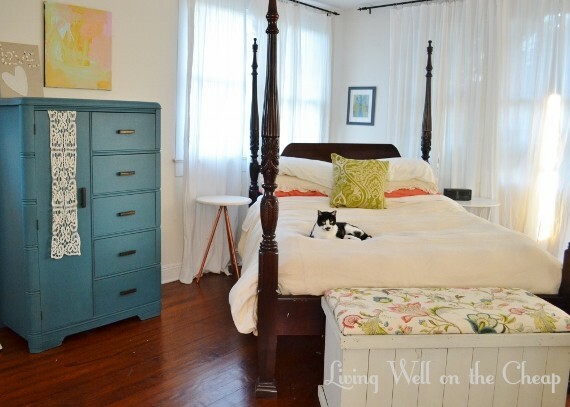 I think that with the painted armoire, you’d be veering into crayola territory. I would probably start with something on the floor. You do have a lot of cool stuff, and I wonder if you need a fabulous rug to anchor the space. I do worry that it would be too busy, but I’m not opposed to painting the blue furniture a mor neutral tone if needed. I agree that a rug would probably help! Why does the paint sprayer have to stay at her house? I’m just saying, it would be enough work to move the bed outside, not sure why you would need to haul it 45 minutes also? But I think brush and roller would be easier….